Pride of Rotterdam (P&O Ferries), sails across the North Sea – on the route linking Rotterdam (Europort) and Hull in the UK. 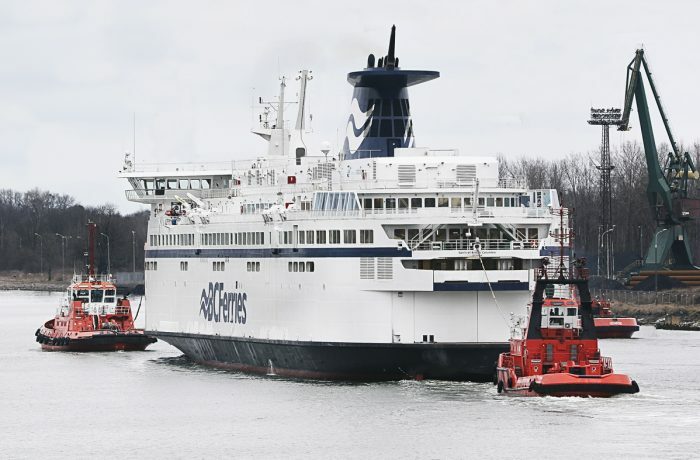 Another one – Mont St Michel, in the colors of the French operator Brittany Ferries – came to Remontowa from its place of work on the English Channel (La Manche), from the Caen Ouistreham – Portsmouth route. The third one, Baltic Princess (Tallink) had to leave the route connecting Turku (Finland), Stockholm (Sweden) and Mariehamn (Åland Islands, Finland). 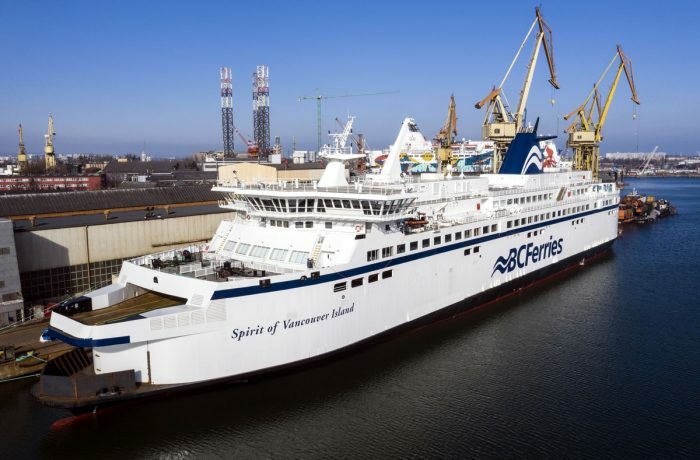 She was moored at the shipyard’s quay, while the remaining two ferries immediately entered the floating docks, where they have been undergoing, among others, maintenance works. The above-mentioned ferries saw other vessels of this type, already berthed or docked at Remontowa SA. It was, among others, the ro-pax ferry Stena Scandinavica (Stena Line). It’s worth mentioning, that in 2010 the ferry called at the shipyard, at that time under the name of Stena Britannica for a large conversion. In turn, in March 2014, a new 90-ton bulbous bow was installed at Remontowa SA on the vessel, while two years ago, the ferry underwent at the shipyard an emergency repair at an express pace. 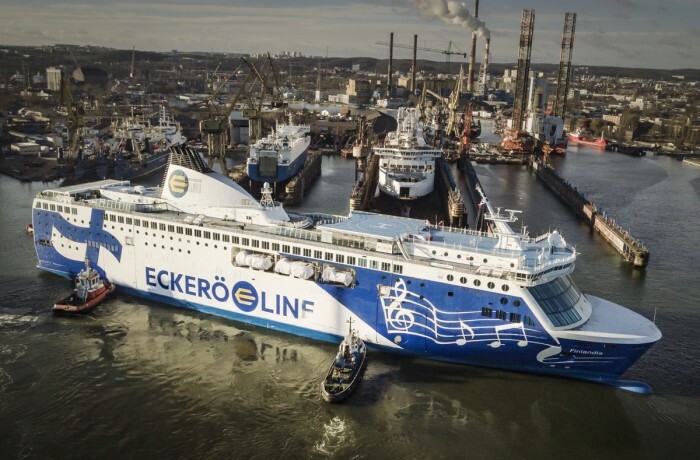 This year, the most important task for Remontowa is retfrofitting the ferry with scrubbers. In the first two months of 2018 there have also been other ferries repaired at Remontowa SA: Stena Spirit (Stena Line), Princess Anastasia (Moby Lines) and Barfleur (Brittany Ferries). 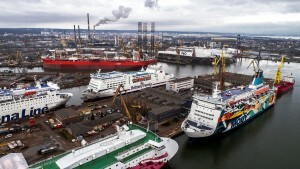 For several days (until January 25, the day of departing straight from the dock, the Pride of Rotterdam ferry), as many as eight ferries of renowned Western European, Scandinavian and Baltic operators were being together serviced at Remontowa, not to mention two other vessels – the Finnwave ro-ro vessel (operated by Finnlines, lengthened at Remontowa departed on January 25), and the Spirit of British Columbia (BC Ferries) ro-pax under conversion to LNG propulsion. Taking this into account the number of ferries being together serviced at that time amounted to as many as 9 vessels! Pride of Rotterdam has undergone repairs and a complete survey of the components of its propulsion drive system. The scope for Baltic Princess included the exchange of reduction gears, while on the Princess of Anastasia ferry repairs of the main engines as well as of its auxiliary units were carried out. During the current winter season, one will see yet another ferries coming to Remontowa SA to undergo a rejuvenating treatment. 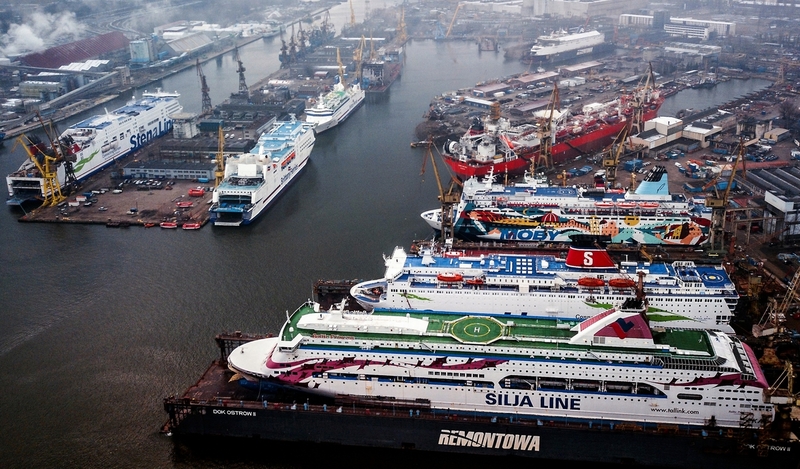 Watch below: some drone footage showing an extremely-busy Remontowa Shiprepair Yard in Gdansk, made by Skyland and PortalMorski.pl on February 4, 2018 and a video reporting entering the yard by three ferries on January 25, 2018 (made by TOSEM).